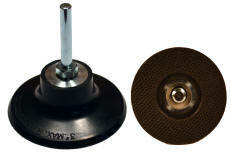 Use our quick change holders to work with both Type R and Type S quick change discs. Refer to the disc photos below to determine the type of discs you use. Type R is on the left and Type S on the right. Download 12 page backup pad catalog. Note that Type S discs 2" and smaller have smaller metal clip. You cannot use a 3" Type S disc with a 2" or smaller Type S holder. Heavy duty molded rubber with a 1/4" straight shank. Priced for both a single piece or a pack of 5 holders at a saving. Each holder includes a 1/4" shank. 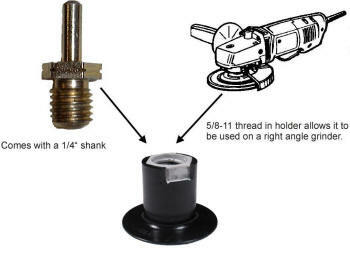 They are unique in that the shank can be removed so the holder can by attached to tools having a 5/8-11 arbor (like a small electric grinder). Adapters are available to convert to other sizes including 3/8-24.